184 Nasty Women artists m/f from 27 countries, 240 artworks from € 1 – € 200. 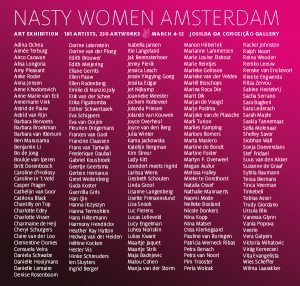 This is the Amsterdam sister of Nasty Women NYC, a group exhibition that serves to demonstrate solidarity among artists who identify with being a Nasty Woman in the face of threats to roll back women’s rights, individual rights, and abortion rights. It also serves as a fundraiser to support Women on Waves, COC Amsterdam and She Decides.